Today is Easter Sunday in Greece! Athens is a ghost town during Easter because whenever possible, Greeks return to their Island or to their Village for this biggest holiday of the year! We had the pleasure of spending two Easters on the nearby island of Poros to enjoy the holiday with our friend Dina and her large family. From the candle light processions around the village and to the church on Saturday night, followed by the traditional midnight meal of a soup called magirtisa to prepare the stomach for the Easter feast, it is quite an event! By mid day on Sunday the cooking is well underway and finally in mid afternoon it is time for dinner! Spanakopita, tyro pita (cheese pie), traditional mezes of tzatziki, melitsanosalada (eggplant), tyrokefteri (spicy cheese dip) and taramasalata (fish roe dip). Greek tomato and feta cheese of course. Maybe some keftedakia (meat balls), gigantes (large beans in tomato sauce), dolmas, and the Greek sausage known as loukaniko. And finally the roast lamb or goat with oven roasted potatoes, and horta! All of this will be enjoyed with Greek red and white wines, and thee are many good Greek wines, as well as ouzo and raki. As you can imagine this is a long slow meal to be enjoyed along with the fine company of family and friends! Yesterday was ‘Clean Monday’ in the Greek Orthodox Religion. “καθαρά Δευτέρα”. It is the first day of Lent in the Orthodox Religion and marks the first day of the fasting diet. It is also a day to celebrate the beginning of Spring, and it is common for people to take a picnic lunch and go somewhere to fly kites. 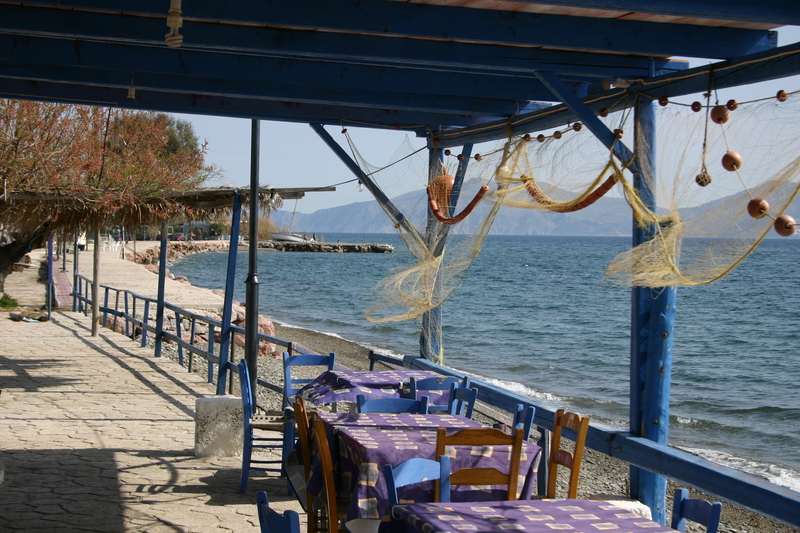 Sitting in this Taverna in the Peloponnese Region of Greece back in 2010, we celebrated this day with our friend Dina. Sitting on the shores of the Saronic Gulf looking across to Hydra made for a wonderful afternoon. Dina made it clear before we ordered that we couldn’t eat ‘anything that bleeds’, so aside from vegetables, Greek Salad with Feta and bread, we enjoyed calamari, shrimp and mussels. And some white Greek wine, of course! And by the way, the ‘Mardi Gras’ period in Greece begins about 10 days before Clean Monday, on a day called “Tsikno Pempti”, or Barbecue Thursday. On that day everyone goes home early to have a dinner of barbecued meats with family. Most people say it’s best if the meats are burned and charred a bit! The smell of barbecue is everywhere and the streets of Athens and most villages are obscured by smoke! Greek Easter is on Sunday May 5th.